Tim Holtz Distress Inks are a collection of 36 waterbased inks that are perfect for the vintage, stained, and aged effects crafters are creating for scrapbook pages, cards, rubber stamping, and altered art projects. When used on papers, photos, fiber, ribbon, wood, and other surfaces, they produce a nostalgic, weathered look. Tim Holtz Distress Inks are also embossable and add versatility with photo tinting and layering. The pads feature a raised felt pad for easier use with direct-to-paper techniques. 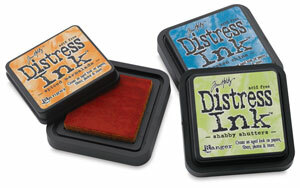 Tim Holtz Distress Inks are acid-free, non-toxic, and fade-resistant. Distress Ink Re-inkers — Re-ink your Tim Holtz Distress Ink pads with these 0.5 oz (15 ml) bottles. The bottles are amber glass to reduce exposure to light and include an eye drop applicator for precise re-inking. Minis Assortment, Set of 4 — Don't let the small size fool you! These stackable 1" × 1" (2.5 cm ×2.5 cm) mini ink pads can be used in the same way as their full-size counterparts. Each kit includes four Ranger Tim Holtz Distress Ink Mini Pads that coordinate with the Distress palette of products.